Today we went to the Fair. Yesterday I spent all afternoon making a Brazilian carrot Smith Island cake, following my notes from last year when I discovered I needed to make 1.5 batches to get 8 layers for the cake. Actually, I made 9, but that's because one broke and I had enough to make an extra. Each set of two layers takes 12 minutes to bake. I made the fudge frosting with bittersweet chocolate instead of semi-sweet, that way it wasn't as cloying. When I was getting it ready to go in my cake tupperware thing, I discovered it was too tall. Whoops! I found a plastic "crystal" plate and transported it on that, covered in plastic wrap. It worked. After dropping off the cake, I checked out the canning competition. Of the 9 categories I entered, I placed in all of them! I got first place in pickled beets and in the conserve category (pear almond), second place in strawberry jam (for the balsamic strawberry jam), other jelly (rose petal), other jam (caramel pear), salsa, and other pickled vegetables (carrots), third place for bread and butter pickles and an honorable mention for the hot pepper sauce/chutney. I'm just grateful they didn't disqualify it for not being a standard chutney. Anyway, I think that's what I won; sometimes the ribbons are on groups of things and it's hard to tell. I'll find out for sure on the 9th when I pick everything up. Next stop was the beekeeping department, where I was very excited to discover that my honey lavender cheesecake won in the cheesecake category! Consider I'd never made the recipe before, I'm so pleased. I visited briefly with my beekeeping mentor and then we moved on. 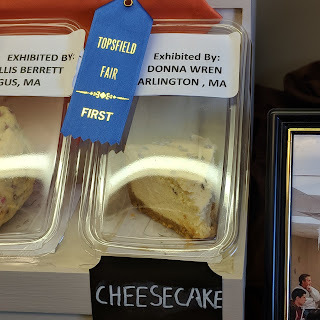 After exploring the fair with friends and checking out the bunnies, eating turkey legs, and otherwise just enjoying the really nice, sunny day, we went back to watch the judging of the "Favorite Dessert" category which is really basically cakes. 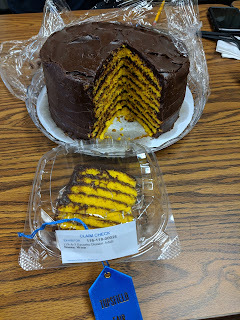 There were seven entries and I could tell my 8-layer cake had done well when the judges fought over the piece. When they read the recipe and saw how I'd made the layers one said, "I'm intrigued." The other said, "That's really good," as they were moving on to the next one. After the judging was complete there was a tie for first place, my cake and another which was a peach crumb cake with bourbon caramel sauce. I think I can understand, without even tasting it, why that also won. I spoke with the judges a bit, the one who is a caterer said he planned to take my cake home with him. I'm not sure if he was joking? But they were impressed with the tiny little layers and the overall flavor. We spent a little more time looking at all the fair things: the giant pumpkin (2,114 pounds! ), the produce displays, the chickens and other poultry, and briefly stopped at a hot dog eating contest as one of the youngerchild's friends was interested. We did not watch the entire 10 minutes of that, everyone was kind of grossed out. Now we're home and all of us are exhausted. I think I may take a nap! I would say "Very" successful! Great job!